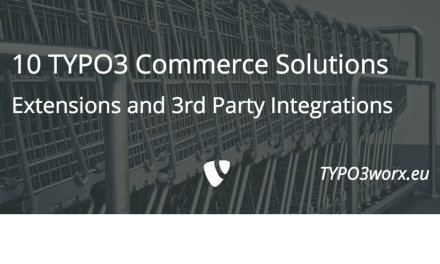 This week the christmas edition of TYPO3 was released. It is the sixth sprint release of TYPO3 version 8. Again some new and shiny features hit the public. In this post I will give you a quick overview of the new features, important changes and bugfixes. I grouped them according to “the target audience”, so that you can spot the changes, which are important to you more easily. Tabs, which are recurring in different record types, were streamlined. Similar fields, that were distributed across different tabs, are now placed on the identical tabs. That means for editors, that some fields may have moved to other tabs to be consistent. The reason is for these moves are to ensure that the labels of the tabs are more meaningful. This leads to the aspect for developers in this topic: You are strongly encouraged to follow this systematic of tabs and adjust the placement of fields to the strategy of the core. You should get rid of tabs named that have an unspecific labelling of the tabs, like options, settings, extended, miscellaneous. The labels should really provide value and guidance for editors. A new RTE hit the TYPO3 core. It is the CKEditor from http://ckeditor.com/. This is another good example where TYPO3 joins forces with other open source projects. It will be the new default RTE in TYPO3 in the future. The “default” was removed for now just on the release date. This is a good move, as there is no possibility to configure it individually. Making it a default would have raised to many expectations. 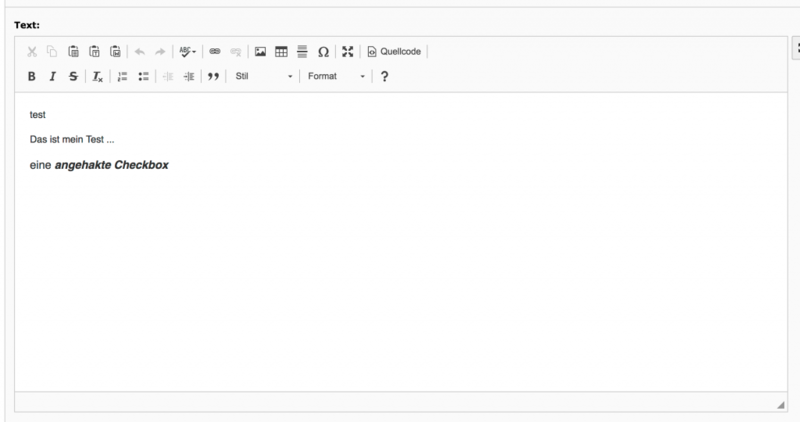 Currently it is possible to use the editor in full fledged mode. Configuration options will be added in one of the next releases. For the last LTS release the sysext form has got an major overhaul. It turned out, that the code was hard to maintain. So Björn Jacob (@tritum) and his agency “Tritum – Die OnlinePiloten” stepped in and did a complete rewrite of the form extension. The details of the history and the features are shown in the presentation, which was held at the TYPO3camp in Essen. You can find it here at slideshare. These two new features deserve more than just two short paragraphs. So I will dedicate special blog posts about each of them in the next weeks / months. (So stay tuned). Until 8.4 integrators were able to register new languages and their language packs. If these were deactivated, the l10n zip files stayed in the filesystem under “typo3conf/l10n/”. Now it is possible to deactivate and remove the language packs by clicking on the trash bin in the language module. 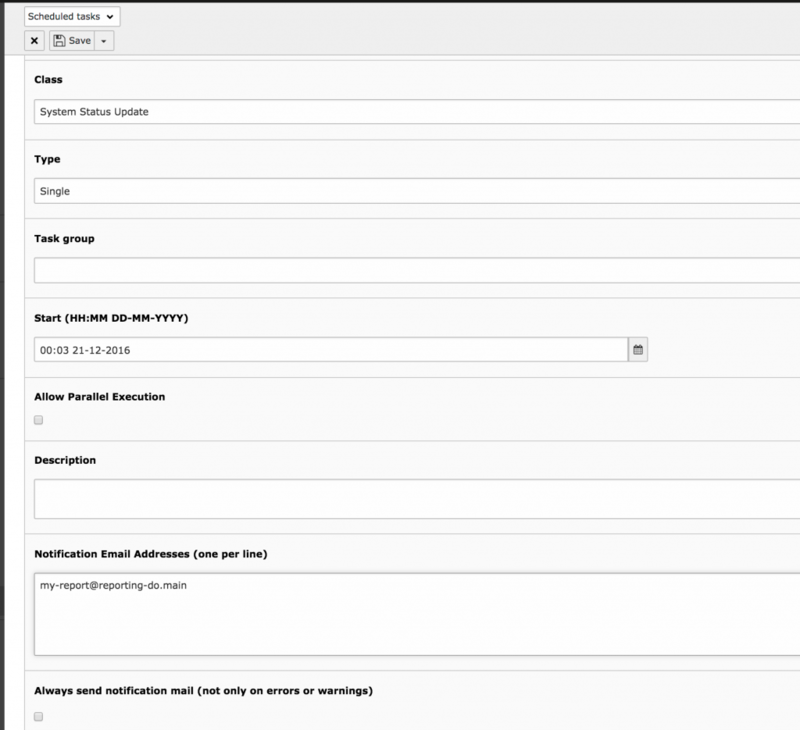 The scheduler now provides a task to send status reports via email. Until the 8.5 release it was only possible to get this information from reports module. Furthermore it is possible to decide if the report should only be sent if an error occurs or also if everything is fine. The InstallTool now provides the possibility to re-check already executed upgrade wizards. 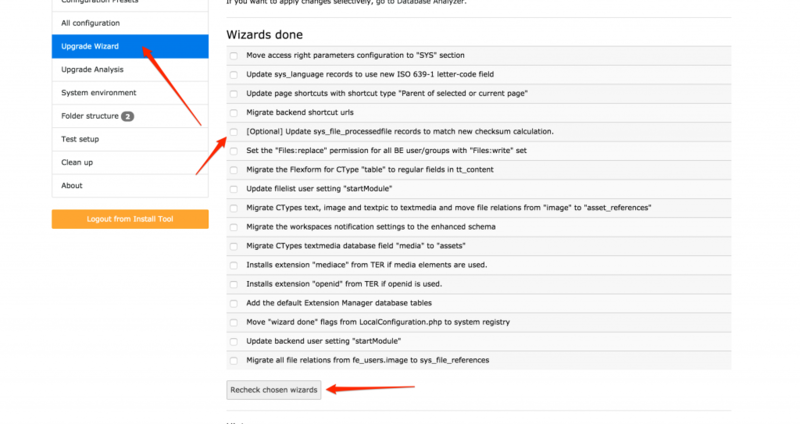 This is especially helpful, if you do data migrations and need to re-run certain (or all) upgrade wizards again. If a upgrade wizard is checked, it will re-activate the wizard step for the next run and re-check, if everything went ok. Modifications of the array “$GOBALS[‘TCA’]” in ext_tables.php of extensions is not allowed any more. This check in the InstallTool checks all installed extensions, whether they try to do it. If so, the check will give the appropriate feedback. If it is your own extension, you should really find an appropriate solution to avoid this. If it is a 3rd party extension, please support the extension author with a report and a patch. These were my personal main picks of the changelog. There are many more! All in all there are over sixty feature, breaking or deprecation changes. For a complete list have a look at https://docs.typo3.org/typo3cms/extensions/core/8-dev/Changelog/8.5/Index.html There you finde a complete overview over all these changes. A similar source is the section “Upgrade analysis” where all these changes are also available (if you have installed the current release). After all I want to thank all contributors for their time and dedication for this release”. I am really looking forward, to what we will see in the next sprint aka “Valentine Edition” and LTS release. The blog post image was published on unsplash by Katarzyna Kos using the Unsplash license. Modified using Pablo on Buffer by myself.